The Sjögren’s Syndrome Foundation works to educate the public about this complicated and debilitating disease, and how it affects those who live with its daily manifestations. 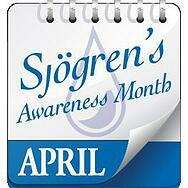 This April, we will use 30 words to help raise awareness of Sjögren’s. Everyday in April we will post a word of the day that reflects about what is Sjögren’s, to help increase awareness and education of this invisible illness. You are the voice of Foundation and if you are living with this disease or know someone who is, what is one word that represents “Sjögren’s” to you? Please share your word by commenting below. Thank you for your support and together we will make Sjögren’s a household name! As many as four million Americans are living with Sjögren’s, a chronic autoimmune disease in which people’s white blood cells attack their moisture-producing glands. Although the hallmark symptoms of Sjögren’s are dry eyes, dry mouth, fatigue & joint pain, it is a systemic disease and affects the entire body.